There are few things as endearing and attractive as a sincere smile. However, if your teeth have noticeable aesthetic flaws, you might hold back from using your smile to let the world know how amazing you are. 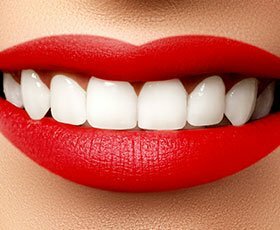 Thanks to Lumineers or porcelain veneers in downtown DC, though, you might soon have a set of pearly whites that you’re eager to show off. What Are Veneers and Lumineers? 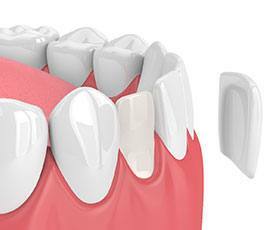 Porcelain veneers are thin pieces of porcelain that a dentist permanently attaches to the fronts of your teeth. They are custom-made to fit your smile perfectly, and their purpose is to disguise everything you don’t like about your teeth. Lumineers are a specific type of porcelain veneer; the biggest difference between them and their traditional counterpart is that Lumineers are slightly thinner. Typically, veneers go just on the top teeth. However, they are also sometimes used to enhance the appearance of the bottom teeth as well. What Is the Process for Placing Veneers and Lumineers? Your journey to a perfect smile begins with a cosmetic consultation in our office. We’ll discuss your goals, budget, and expectations and then design a treatment plan. 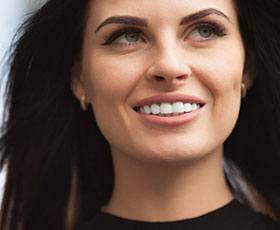 If veneers or Lumineers are right for you, we’ll get to work on crafting your gorgeous new look. With porcelain veneers, we must remove an ultra-thin layer of tooth enamel so your new look doesn’t appear bulky or unnatural. Then, we take impressions and photos of your smile so a dental lab can create your custom veneers. You’ll come back for a second appointment when the veneers are ready to be placed. The process is similar with Lumineers. However, they do not require the removal of any enamel. Who Is a Candidate for Veneers or Lumineers? You have noticeable aesthetic flaws in your smile that you would like to correct. You have healthy gums and teeth. You’re dedicated to maintaining excellent oral hygiene. You are free of significant orthodontic problems. You understand the costs associated with the procedure; dental insurance does not cover cosmetic treatments. Consume staining foods and beverages in moderation; although porcelain resists stains, it can become discolored over time. Avoid using your teeth to open packages or to bite on hard objects, such as ice or jawbreaker candy. Contact your cosmetic dentist if a veneer ever breaks or feels loose. Are you ready to discover how porcelain veneers or Lumineers could give you the smile of your dreams? Contact Davidson Dental Associates today to schedule your cosmetic dentistry consultation.